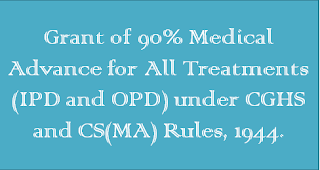 Guidelines Regarding Prevention of Sexual Harassment of Women at the Workplace – DOPT. 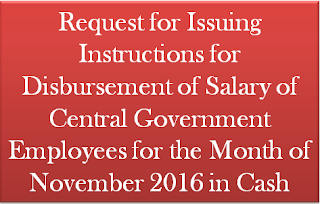 Subject:- Central Civil Services (Conduct) Rules 1961 – Guidelines regarding prevention of sexual harassment of women at the workplace – regarding. 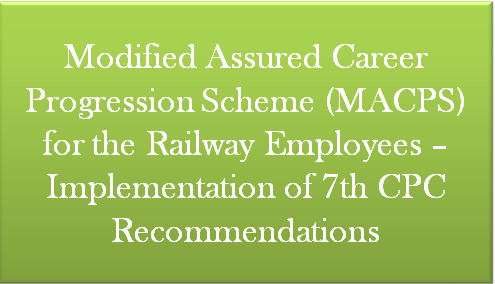 Subject: Modified Assured Career Progression Scheme (MACPS) for the Railway Employees – lmplementation of seventh CPC recommendations. 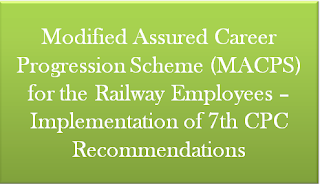 The Modified Assured Career Progression Scheme was introduced with effect from 01.09.2008 in pursuance of the recommendations of the Sixth Pay Commission by this Ministry’s letter No.PC-V/2009/ACP/2, dated 10.06.2009 (RBE No.101/2009). 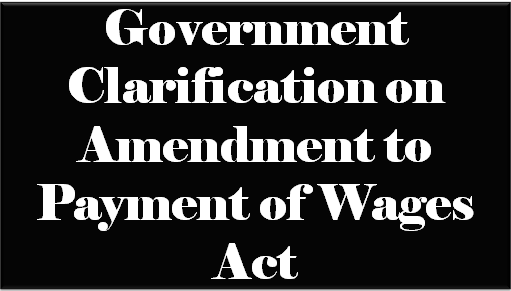 Thereafter, subsequent amendments/clarifications were issued from time to time. These instructions are in force with effect from 01.09.2008. “1. 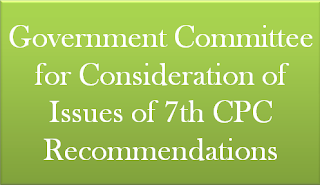 There shall be three financial upgradations under the MACPS as per 7th CPC recommendations, counted from the direct entry grade on completion of 10, 20 and 30 years services respectively or 10 years of continuous service in the same level in Pay Matrix, whichever is earlier. 8. 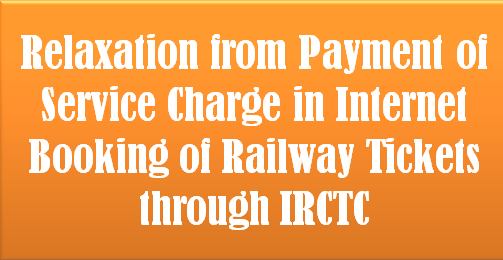 This issues with the concurrence of the Finance Directorate of the Ministry of Railways. 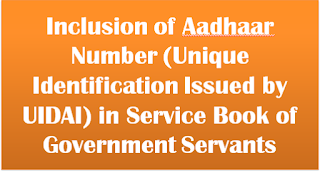 Inclusion of Aadhaar Number (Unique Identification Issued by UIDAI) in Service Book of Government Servants. 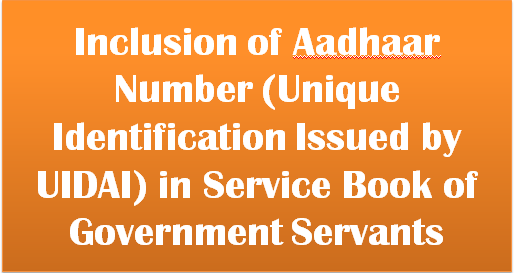 Sub: Inclusion of Aadhaar Number (Unique Identification Issued by UIDAI) in Service Book of Government Servants. As Railway administrations are aware, in terms of extant rules/instructions every event in a Government servants’ official life must be recorded in his Service Book and each entry is to be attested by the Head of office. “1234. Scrutiny by Employees: It shall be the duty of every Head of Office in initiate action to show the Service Books to railway servants governed by pension rules under his administrative control every year and to obtain their signature therein in token of their having inspected the Service Books. 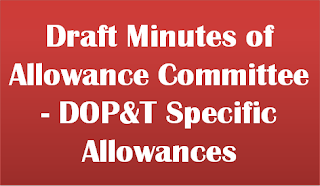 A certificate to the effect that he has done so in respect of the preceding financial year should be submitted by him to his next superior officer by the end of every September. 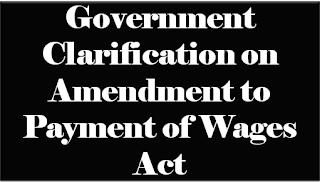 The railway servants shall inter-alia ensure before affixing their signature that their services have been duly verified and certified as such. 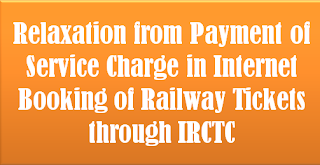 In the case of a railway servant on foreign service, his signature shall be obtained in his Service Book after the Accounts Officer has made threin necessary entries connected with his foreign service. 3. 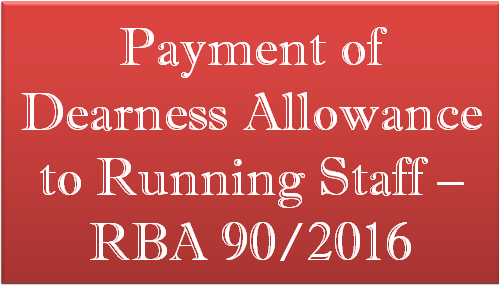 Furthermore, Rule 47 of the Railway Services (Pension) Rules 1993 provides for issuing a communication on completion of 18 years of service and five years before retirement, as part of preparatory work for sanctioning pensionary benefits. 4. Besides aforesaid directives, pursuant to Government of India’s instructions, it has also been decided that Aadhaar numbers of all Railway Servants should be included in their Service Book. 5. 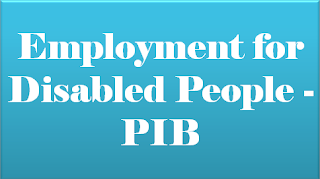 Therefore, all Zonal Railways/Production Units etc, are directed to ensure that the Service Book of all employees have an entry of the employee’s Aadhaar number. Immediate necessary action in this regard may please be taken and the number of employees whose Service Books have been seeded with their respective Aadhaar number may be intimated to Board’s office within a month’s time. 6. In this connection, attention of Zonal Railways is invited to Board’s letter No. 2015/ED/ERP/UIDAI/01 dated 21/7/2016 wherein Railways/Production Units were directed to arrange for Aadhaar numbers and field units are expected to have taken action already. 7. This issues with the concurrence of the Finance Dte. 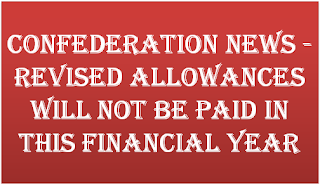 CONFEDERATION NEWS - REVISED ALLOWANCES WILL NOT BE PAID IN THIS FINANCIAL YEAR. 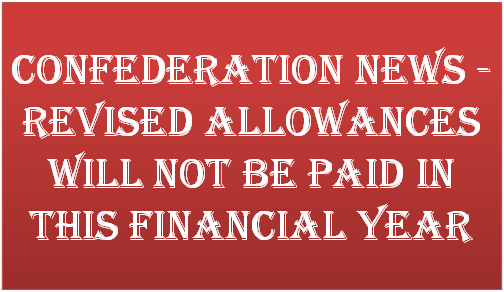 REVISED ALLOWANCES WILL NOT BE PAID IN THIS FINANCIAL YEAR. 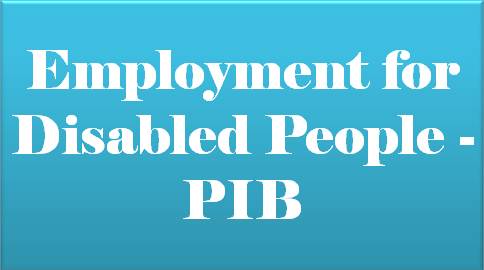 Dr. Urjit R. Patel, Governor, Reserve Bank of India has made the following observations in a media conversation which is published in RBI website. 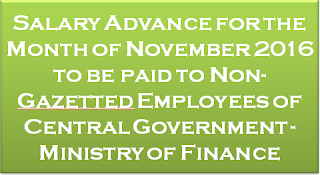 (2) The extension of two months given to the Ministry of Finance to receive the notification on higher allowances under the Pay Commission's award, COULD PUSH IT'S FULLER EFFECT INTO THE NEXT FINANCIAL YEAR rather than this financial year. 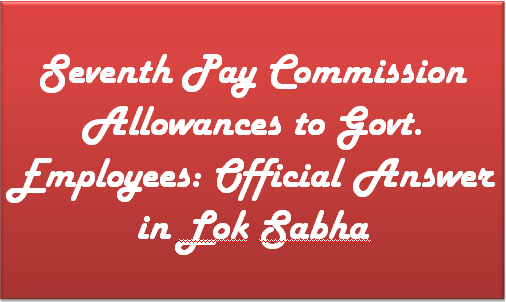 "The anomalies arising out of implementation of 7th Central Pay Commission will be examined by the Anomaly Committee which has already been constituted. Based on the report of the Committee, the matter will be considered by the Government and appropriate decision will be taken. 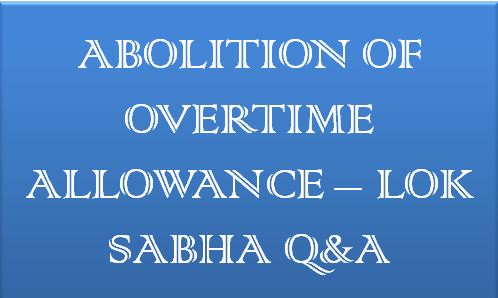 From the reply it is clear that the question of increase in Minimum Pay and Fitment factor is to be decided by the Anomaly Committee. 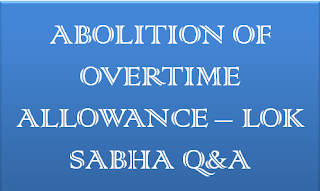 That is why the Government has not formally constituted THE HIGH LEVEL COMMITTEE as assured by the Group of Ministers to the JCM Staff side leaders in the 30th June night discussion. And this is the reason for Group of Senior Officers behaving as if they .don't know what the task is assigned to them. 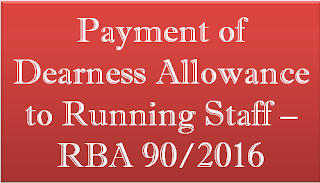 Now by 30th December SIX months will be over after the 30th June assurance given by Group of Ministers including Shri Rajnath Singh , Hon'ble Home Minister , Shri Arun Jaitley , Hon'ble Finance Minister and Shri Suresh Prabhu , Hon'ble Railway Minister . 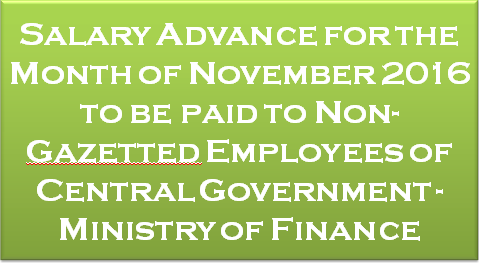 Employees and Leaders have never expected such blatant breach of assurance given by Senior Cabinet Ministers of NDA Government. 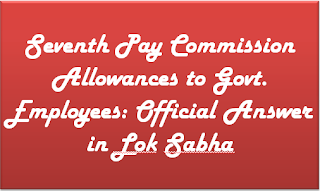 The One man Committee constitute by Government for revision of wages and service conditions of three lakhs Gramin Dak Sevaks of Postal Department had submitted it's report to Government on 24th November 2016. Even after 20 days, the Government is not ready to publish the report or give copy to the recognised Federations. 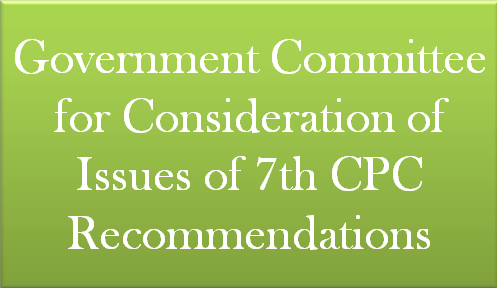 The one and the only favourable recommendation of 7th CPC ie; Parity between past and present pensioners (Option - 1) stands referred to a Committee which has taken a stand that Option - 1 is not feasible. 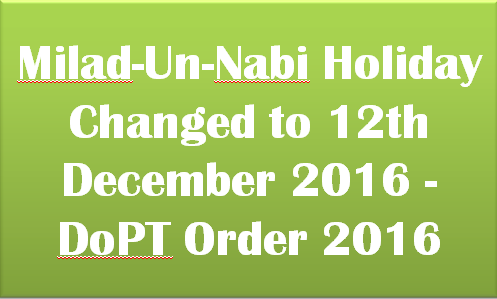 Sub: Change of date of holiday on account of Milad-Un-Nabi or Id-E-Milad during 2016 for all Central Government administrative offices located at Delhi / New Delhi. 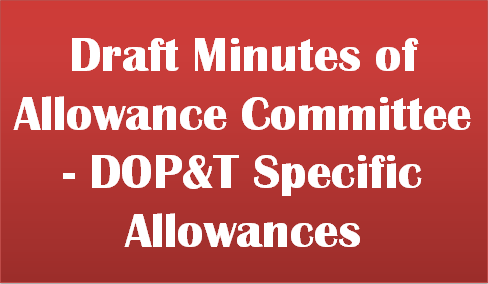 As per list of holidays circulated vide this Ministry’s 0.M.No.12/7/2015-JCA-2 dated the 11th June, 2015, the holiday on account of Milad-Un-Nabi or Id-E-Milad falls on Tuesday the 13th December, 2016. It has been brought to notice of this Ministry that in Delhi Milad-Un-Nabi or Id-E-Milad will be celebrated on 12th December, 2016. 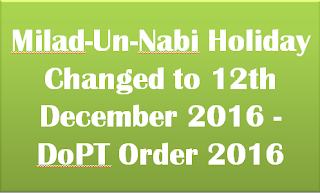 Accordingly, it has been decided to shift the Milad-Un-Nabi or Id-E-Milad holiday to 12th December, 2016 in place of 13th December, 2016 as notified earlier, for all Central Government administrative offices at Delhi / New Delhi. 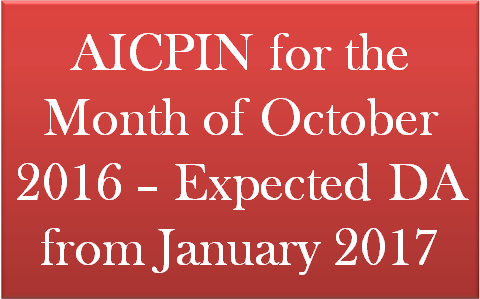 The All-India CPI-IW for October, 2016 increased by 1 point and stood at 278 (two hundred and seventy eight). On 1-month percentage change, it increased by (+) 0.36 per cent between September and October, 2016 when compared with the increase of (+) 1.13 per cent between the same two months a year ago. The maximum upward pressure to the change in current index came from Food group contributing (+) 1.01 percentage points to the total change. At item level, Rice, Wheat, Wheat Atta, Besan, Black Gram, Gram Dal, Poultry (Chicken), Milk (Buffalo & Cow), Brinjal, Cauliflower, French Bean, Lady’s Finger, Methi, Peas, Tomato, Cooking Gas, Petrol, Toilet Soap, Tailoring Charges, etc. are responsible for the increase in index. However, this increase was checked by Moong Dal, Urd Dal, Groundnut Oil, Fish Fresh, Apple, Banana, Potato, Electricity Charges, Soft Coke, etc., putting downward pressure on the index. The year-on-year inflation measured by monthly CPI-IW stood at 3.35 per cent for October, 2016 as compared to 4.14 per cent for the previous month and 6.32 per cent during the corresponding month of the previous year. Similarly, the Food inflation stood at 2.99 per cent against 4.05 per cent of the previous month and 7.50 per cent during the corresponding month of the previous year. At centre level, Mundakkyam and Darjeeling reported the maximum increase of 8 points each followed by Jamshedpur and Amritsar (5 points each). Among others, 4 points increase was observed in 4 centres, 3 points in 8 centres, 2 points in 13 centres and 1 point in 20 centres. 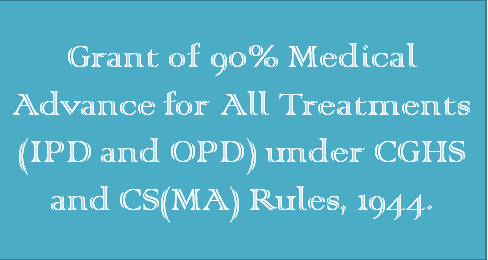 On the contrary, Goa recorded a maximum decrease of 7 points followed by Bhavnagar (5 points). Among others, 2 points decrease was observed in 4 centres and 1 point in 8 centres. Rest of the 15 centres’ indices remained stationary. The indices of 35 centres are above All-India Index and other 42 centres’ indices are below national average. The index of Vishakhapathnam centre remained at par with All-India Index. 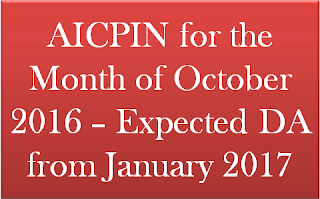 The next issue of CPI-IW for the month of November, 2016 will be released on Friday, 30th December, 2016. 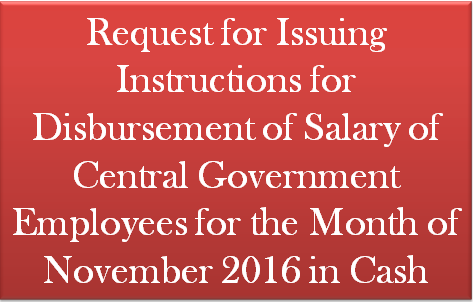 The same will also be available on the office website www.labourbureaunew.gov.in. 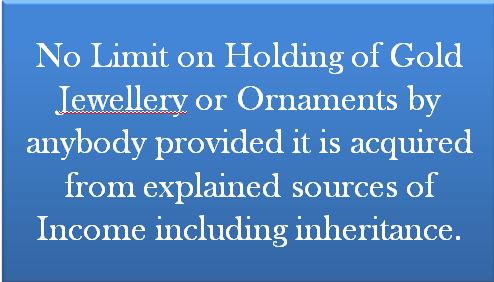 No Limit on Holding of Gold Jewellery or Ornaments by anybody provided it is acquired from explained sources of Income including inheritance. 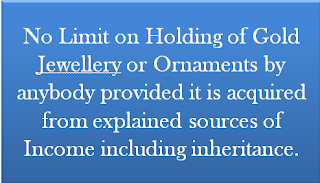 Various points clarified with respect to gold jewellery and ornaments; No limit on holding of gold jewellery or ornaments by anybody provided it is acquired from explained sources of income including inheritance. (e) Officer conducting search has discretion not to seize even higher quantity of gold jewellery based on factors including family customs and traditions.